There is no question that broadband, mobile and social media are playing ever-growing roles in women’s lives in both Canada and the U.S. However, our 2-year research study on Women & Digital Life, first conducted in the U.S. and later replicated in Canada, reveals significant differences between the female populations of the two countries. Here are some of our headlines. Canadian women are more active online in practically every category, e.g., instant messaging, watching short video, Canadian moms surfing with their kids. The exceptions are online shopping (57% online women in the U.S. vs. 41% in Canada) and viewing TV shows online (22% vs. 14%). In the case of online shopping, there is greater choice in the U.S. and there are more retailers competing for women’s share of spending online. In the case of online TV, American networks have been providing access to their shows online for a longer period of time, plus of course there is no equivalent to Hulu.com in Canada. Attitudinally, more Canadian women feel the need to “unplug from technology with a book or a magazine” (67% agree) versus American women (56% agree). Canadian moms are using broadband and mobile technology to help them with their parenting tasks as well as to keep themselves and their kids entertained. Moms in Canada use PVRs and video-on-demand to coordinate children’s TV viewing, although not to the same extent as in the U.S. Over half (53%) play video games with their kids, while 67% surf the web with their children. While Canadian moms are more likely to surf the Internet with their kids compared to U.S. women (67% vs. 58%), they are less likely to share their mobile phones with their kids (36% do so in Canada versus 55% in the U.S.). In terms of mobile phones, American women are more likely to have them. Nearly one-in five women with a wireless device (18%) has a smartphone in Canada, about the same level as in the U.S. But Canadian women are less likely to use the full functionality of their cellphones. While 52% of Canadian women with a wireless device sent a text message in the last month, the comparable number in the U.S. was 61%. Taking a photo with a cell phone is at 41% vs. 55% in the U.S. And 17% of women play a game using a wireless device in Canada compared to 27% in the U.S. This pattern repeats for most other functions of the wireless device. Ownership of game consoles and handhelds is similar in both countries (55% of Internet households). And one-in-three women play video games using a handheld or a console. Web/PC game play is only slightly higher in the U.S. In terms of game console use, Wii is #1 in Canada while PS2 is slightly ahead in the U.S. Guitar Hero is the leading game title in the U.S. whereas Wii Fit takes the top position in Canada. Canadian women spend less time watching TV than American women overall. 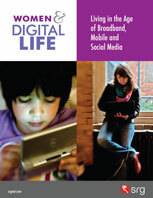 And this is reflected in use of and access to digital TV technologies. American women are twice as likely to have used a DVR/PVR to watch a TV show, and weekly cable video-on-demand use is also double that of Canada (24% vs. 12%). Differences in TV viewing by PVR or VOD also extend to online TV where 22% in the U.S. watched a full-episode TV show online vs. 14% in Canada. In nearly half of all households (46%), the TV is on “most of the time in the background” even if no one is watching a specific program. Canadian women are lighter TV viewers than American as mentioned before, but pay more attention to their favourite shows. Overall, more Canadian women participate in social networking online, thanks to the extraordinary popularity of Facebook. Two-in-three online women have a Facebook profile in Canada compared to 28% in the U.S.
Our research finds that 21% of online women in the U.S. are social media Influencers. In Canada, 14% of online women are classified as Influencers. Influencers belong to multiple social networks and have more friends on average on these networks, including people they only interact with online. Blogging, Twitter and active Facebook use in terms of sharing links and creating groups are some of their defining characteristics. Socials make up 43% of online women in the U.S. compared to 62% of Canadian women. While they are certainly connected, they are not as active as Influencers in their communication within their networks nor do they create content at the same rate as Influencers. The composition of Socials’ networks is concentrated on close friends and family. In short, more women participate in social media in Canada but a smaller proportion exhibit opinion-leading Influencer behaviour.